The Beach club has much to offer. There are activities for all age groups kids, teens, and adults.Amenities include 8 tennis courts, basketball court, and children's play area. There is onsite dining,with fine dining restaurant The Coast, and a casual restaurant the Hideway. a small workout facility..The re is a guest resort fee if you choose to use the club/spa facilities. The area is abundant with fabulous golf courses, Kiva Dunes, The Peninsula, and the Gulf Shores Golf Club are just minutes away. Other area attractions include Mobile Bay ferry to Dauphin Island, an outlet mall, fishing, and the track for the kids.
! !COME AND ENJOY!! You can do as much or as little as you want!! We enjoyed our week's stay very much. It was very nicely furnished, and even nicer than pictured. Well appointed, with everything we needed. Very roomy. The master bath shower was large and very nice. The views from the balcony were outstanding, especially the sunsets. We only wish the weather had been better during our stay. We hope to rent from the owner again in the future. Highly recommend and will stay here again!! This beautiful condo was so much nicer than the pictures were even able to portray. It exceeded all of my expectations. My husband, myself, and our 5 children (four of whom are teenaged boys) stayed here after finding it on vbro.com and we had no idea what to expect. The amenities were nice, the area up front with food trucks was within walking distance, but of course there was continual golf cart service to take you to and from the lawn area. 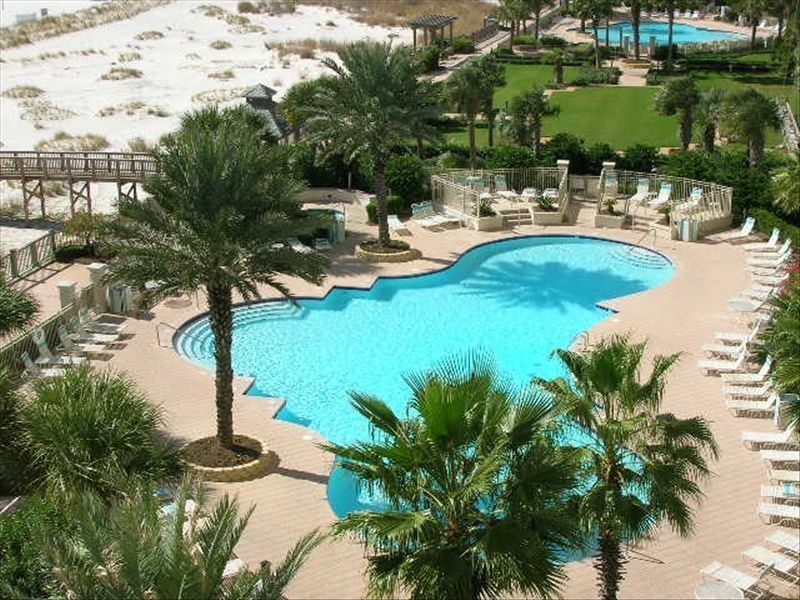 You could stay at the resort all week and never need to go into Gulf Shores' congested traffic. Plenty of safe places to run/walk for exercise. I just cannot say enough positive things about this place! Alao, the owner, Becky, was always super quick to respond to emails and I was informed of the process every step of the way. I will recommend it to anyone and will definitely stay here again in the future! Family enjoyed all the kid friendly activities. The unit is very large and comfortable. The views are amazing. I would recommend this unit to anyone looking for a weekend getaway to a lengthy beach visit. It is very comfortable and the view is amazing. We just came back from a week long vacation at this place and it was absolutely amazing! We loved it! The condo was very clean , kitchen was fully equipped, very nicely decorated and the view.... omg, the view is to die for. We spent a lot of time on the balcony enjoying the view of the ocean and we even saw a few Dolphins on a couple of occasions. We loved that the condo is so close to the beach, it was so easy as we have 4 kids and our youngest one is only 3 and we took a lot of toys to the beach with us. There is a small grocery store less than half a mile from the condo that has all your basic needs. So you have everything you need within minutes. The owner was great! She was really nice and responded to emails within minutes! We had an amazing time and we will definitely be back next year! Our Favorite Place to Vacation! We have rented this condo for the past nine summers. We come with our adult children and grandchildren. We LOVE IT!! The owners are wonderful to work with--the condo has great features and is always clean and ready for us when we arrive. Each summer when we open the door, we find that they have made upgrades and added new amenities. Everything you need is right there--this is a great feature, as well as the accessibility to the beach, to shopping and to restaurants. After we make our reservations and send in our payment we receive our key code and parking passes and we are ready to go! Great views--great people to rent from, and great spot to vacation. We give it 5 stars from our family.